Council candidate Adam Vaughan responded to parents’ concerns about port authority activities for new Island airport ferry. The work disrupted city property and polluted nearby school and homes with dust, while heavy trucks rumbled all morning. Heavy trucks lined up on Lower Bathurst just yards away from children playing soccer in a schoolyard. Bathurst Street? Judging by the approach to safety, it looks like it‚s the same crowd that’s running the new ferry system to the island airport. Minus the smoke screen and panic attacks it’s an accident waiting to happen. For all intents and purposes the Port Authority has taken over the road with no regard for the neighbourhood. The street is supposed to belong to the public, yet City Hall has done nothing to control its use while construction of the new ferry dock is underway. Neighbourhood children have to dodge large dump trucks on the way to school and construction vehicles drive into the playground while recess is underway and kids are playing soccer. This stretch of Bathurst south of Queen’s Quay is a mess. 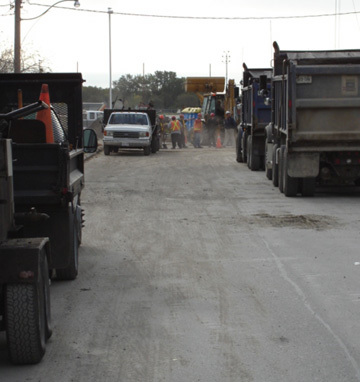 Dust is everywhere; heavy construction vehicles race around; there are no protective fences. The only thing missing is City Hall. Why haven’t city inspectors shut this site down? On Tuesday, Oct. 10, local residents frustrated with the situation contacted me. I got in touch with the local school trustee, the principal of the Waterfront School and the community centre demanding action to protect local kids. Together we phoned the Board of Health, the mayor’s office and the local building inspector, and the police demanding the City take control of the site. Only the police responded. Two officers forced the construction company to post a pair construction workers on Bathurst to control truck traffic. They also issued a warning to the construction crew to make sure dump trucks stopped using side streets in the area. Police authorities are now pressing City Hall to provide a traffic crossing guard during school hours while construction is underway. The Board of Health is looking into the dust problem. Why has the neighbourhood been abandoned? Last month the local city councilor was told to pass a motion at council calling for a traffic study. The councilor was also presented with a set of proposed motions to safeguard Bathurst Street during construction. Nothing happened. At the same time Martin Silva was asked to get Toronto’s Emergency Services to conduct a safety audit of the Island Airport and the new ferry service in case of an accident. Silva says the mayor’s office ordered a hold off on taking action. Watching council deal with Bathurst Quay is a little like watching the maiden voyage of the new Island airport ferry. It’s funny to a point and then it gets dangerous. It’s time for a change. We need a local councilor who will defend neighbourhoods at City Hall.